Question/Topic: How to import database? 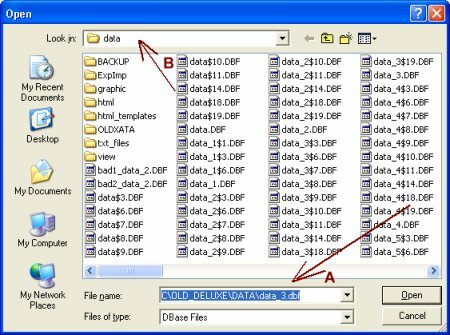 How to move database from one Organizer Deluxe to another (separate installations of the Organizer Deluxe on the same computer)? How to import database template downloaded from the Template Center? Check the file name of the database that you want to import. Copy the file name together with the path to your clipboard or Windows Notepad program. How to check the database file name? Start your new Organizer Deluxe program. On the File menu, click Designer. In the Designer window click Import Database. Enter the file name together with the path into File Name (A) box (use copy and paste). You can also click on the Look In (B) drop down box and locate the folder and the file from the step 1. Click Open. In the Create New Database window enter database name. Click OK.
New database is created with the same structure and the same content. In the Field Layout Designer window click OK. In the Designer click Organizer Designer. On the File menu, click Load Database, select your newly created database and click Load. How to import records from excel files?